A female University of Guyana student was Friday arrested in connection with two days of bomb threats at the University of Guyana, forcing that tertiary institution to close its doors until next week, authorities said. She has been identified as Dianne Jafferali, said to be a close relative of a staunch People’s Progressive Party (PPP) member. Head of the Guyana Police Force’s Criminal Investigations Department, Deputy Commissioner Lyndon Alves said “we pulled her in” based on phone records and her associates. He could not say whether she was cooperating with investigators, but said she was was still being questioned. Alves said legal advice would be obtained, possibly at the weekend, because “we do not want to violate her constitutional rights”. The 72 hour continuous detention period expires on Monday. Jafferali’s lawyer, Latchmi Rahamat, said the woman has denied the allegations put to her. “The young lady has denied all allegations. She is proclaiming her innocence,” she told Demerara Waves Online News. Police sought to assure the University of Guyana’s Turkeyen campus community that the bomb threats were the work of mischief-makers and there was no need for students and staff to be worried about their safety. “Following the recent events where schools and the university of Guyana were receiving bomb threats, the Guyana Police Force wishes to indicate clearly to the general public and specifically to students, teachers, parents/guardians of the schools , the university and its auxiliaries that from our investigations there is no significant threat. Our investigations have revealed so far that students either by themselves or with other persons decided to be mischievous and endeavour to disrupt the existing peace and calm in society and specifically in the education sectors,” the law enforcement agency said. 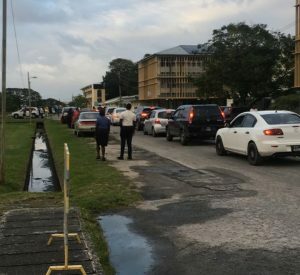 The University of Guyana on Thursday announced that it would be closed until Monday, February 11, 2019 “to enable a comprehensive assessment of the situation following a bomb threat for the second day in succession.” “The closure of the campus will enable the Administration, staff and Student Leaders to review the situation and enhance preventive and responsive measures for such threats,” the institution said. Police and fire fighters reportedly conducted a thorough search of the campus on Wednesday afternoon, February 6. “No explosive of any kind or suspicious object was found during his search,” UG said. In recent weeks, violent threats against School of the Nations, Bishop’s High School and Queen’s College have been circulating on Social Media. Fear also stalked students and parents more so after the Principal of School of the Nations, Dr. Brian O’ Toole had been shot hours after a threat had been issued.